Some of you know I play racquetball. In fact I play 2-3 times a week and love it. Imagine if a group of people came to my house from the international racquetball federation to bring me an important message. They believe based on my competitive athletic potential that I could be the number one player in Texas. And they are willing to help me get there. Wow! I can see myself now, swinging my racquet inches off the wooden floor with incredible power, hitting roll-outs off the front wall with no way for my opponent to return the ball. I see myself standing on the podium with the greatest humility, receiving the trophy and all the accolades. It would be incredibly cool to be the number one racquetball player in the state, however, today I cannot even beat all the players at the local LA Fitness here in McKinney. Given that it is correct that I have the athletic potential to be number one in Texas, at least in the over 50-age bracket, what would it take to get there? I would have to drastically alter my life by entering a rigorous training regime. I would need to play tournaments on the weekends. I would need to watch training videos and get a personal coach. I would spend hours on the court by myself, practicing shot after shot thousands of times. My diet would change. I would need cardio and weight training to gain the strength and endurance necessary to be number one. The thought of being the number one racquetball player motivates me, but the price to get there intimidates me. Right now, I kind of like my life the way it is. So I could have a major decision to make. I can wish I were a better player, but I will never be number one without making an intentional decision to do it. So do you. And it matters so much more than racquetball. God says that we can become like Christ. We can be reformed into his image, which is a much more valuable goal that being number one in a sport. What holds us back? We hope we become more mature spiritually, but we are making such little progress. We still yell at our kids. For me I get so frustrated at my selfishness, especially when I am tired or stressed. The other day on a phone call, a friend asked me a pointed question that I heard as an accusation and immediately saw red. I was insulted and said so forcefully with anger. Right away, I was embarrassed and felt frustrated with myself. Am I not more mature than that by now?! In the Bible, God promises we can be transformed. We can be formed like Christ so we are no longer attracted to most sins, but repulsed by them. We no longer force ourselves to love, we want to give to others. It just makes sense to choose what is pleasing to God. It’s who we have become. How can we be formed into those kind of people? 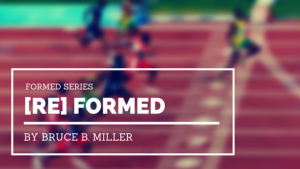 In our new series, Formed, that is the question we are answering. This is second message in the three-week series. You can become like Christ, experiencing this amazing divine-kind of life God offers us by seeing the destination clearly, choosing to pursue it intentionally and doing the practices faithfully. God has given us all we need to develop into Christlike, Spirit-filled, godly people. Today we will see that you CAN be become more like Jesus by intentionally choosing to be re-formed. Last week Jaime painted the vision of what we could become. What do you really desire for your life? Vision: what do we desire? The first hurdle to being formed into the people we could become is to see the vision. Do you see what it would look like to be transformed toward the character of Jesus Christ, and do you desire it? What is the goal of your life? The apostle Paul declared his goal, 7 But whatever were gains to me I now consider loss for the sake of Christ. 8 What is more, I consider everything a loss because of the surpassing worth of knowing Christ Jesus my Lord, for whose sake I have lost all things. I consider them garbage, that I may gain Christ . . . 10 I want to know Christ—, (Philippians 3:7-8, 10.) Is this your heart-cry? Do you desire God more than anything else in your life? He is worth it all. And he offers us a life with him beyond compare. He invites us to be his representatives on earth. He empowers us to act and speak in his name, to build spiritual families, communities where everyone is loved. He promises ever-increasing peace, joy and contentment, regardless of circumstances. It may seem impossible, but this is the good news of the gospel—that you and I can be transformed. Jaime shared Dallas Willard’s definition of spiritual formation that we both appreciate. “Spiritual Formation for the Christian basically refers to the Spirit-driven process of forming the inner world of the human self in such a way that it becomes like the inner being of Christ himself.” My inner world, my heart, will, mind, and feelings will reflect the heart, will, mind and feelings of Christ. Too many Christians settle for far less than this. They are stuck, making little progress on the path to Christlikeness. Where are you on the path to Christlikeness? At Christ Fellowship, we talk about four stages that most people move through: exploring, starting, growing and maturing. Exploring is where you are checking out the reality of Christ, but have not yet trusted in him as your Savior. Starting is where you are beginning in your relationship with Jesus. Growing is a phase of significant movement as you more and more give your life over to Christ. Finally, the maturing phase is when you are utterly surrendered to Christ, all-in, holding nothing back. Where are you? What obstacles hold us back? Obstacles: what holds us back? Why have my racquetball skills plateaued so that I’ve stayed at the same level for years now? More importantly, what is holding us back from spiritual growth to become mature in Christ? See if you have faced some of these obstacles. I’m a decent racquetball player. We lie to ourselves that we are better than we are. I’m a nice guy. I’m a pretty good person. I’m doing OK spiritually. We want others to affirm us just the way we are without changing. This is not reality. We are not that good. We need to face reality and not stay stuck in denial. Then there is the settling obstacle in the path. This is a huge obstacle in American culture. We use the excuse of “that’s just who I am” to avoid changing into who God invites us to become. We want people to affirm us just the way we are. At Christ Fellowship, everyone is welcome, but we affirm no one as they are. We all seek transformation. We don’t want to stay the same. Psychologist Aaron Beck says that the single belief most toxic to a relationship is the belief that the other person cannot change. How often have you heard or said to yourself something like, “I’m just a procrastinator. I have a short-temper. I’m an alcoholic. I’m just an inpatient person. I’m gay. I’m an anxious person. I’m just not very religious. I have a big mouth.” But transformation is possible through the power of God. Then we must hurdle the obstacle of blaming. In racquetball I can blame the equipment, the court conditions, anything but me. This victim mentality started all the way back with Adam and Eve right after they ate the fruit in the Garden. I just hate to read the pathetic blaming. God asks, “Did you eat from the tree that I commanded you not to eat from?” You hope Adam says, “Yea, I did and I am so sorry.” Instead, Adam replies, “The woman whom you gave me, she gave me some fruit from the tree and I ate it.” He throws Eve under the bus. Adam even dares to blame God, “The woman You gave me.” We avoid responsibility in every way we can. We blame our parents, the devil, fate and even God. It is never my fault. Finally, we must hurdle the obstacle of passivity. This is not a good time. I’m playing a video game and just beat the next level. “I’ll get to the Bible later, sorry God.” On a larger scale, we fear if we really decide to pursue spiritual maturity, God will ask us to change, so we just put it off. We don’t want to deal with it. So we say, “Sorry, I’m raising little kids. I’m building a business. I’m being a teenager.” Or just flat out, “I am not interested right now.” If you are really going to become who you could be transformed to be, you must see the vision, hurdle the obstacles and frankly, decide. Intention –What do we need to choose? You must make an intentional choice. If I want to be the number one racquetball player in Texas, I must make an intentional choice to pursue that vision, otherwise it will not happen. Just hoping it will happen does not work. If we want to become like Jesus, we must not stay in the mode of merely hoping, but we must move to deciding. Let’s say you want to learn Spanish. You tell your friends you wish you spoke Spanish. Each day you keep hoping you will be more fluent. A strategy of groundless hope is hopeless. You will not become fluent in Spanish by accident, by hoping or wishing. You must make an intentional decision to learn the language. Personal transformation rarely happens by accident or without effort. Although I am embarrassed by how ludicrous it really is, I actually do hope I get better at racquetball without doing anything to improve, other than playing the same guys. I see this so often in Christians. In other areas of our lives we may be quite intentional such as in business, in raising our children, in school or in our fitness; weirdly, in our spiritual lives we just drift along, hoping we mature. Imagine the insanity of day after day waiting to see if Spanish fluency will just happen, and yet we do that with God, just hoping we develop the fruit of the Spirit, become more loving or know Jesus better. But Christians object and say that salvation is by grace not by works. “The Christian life is not one of striving and straining. It’s not about my effort but about God’s grace. Only God can transform us. Christianity is not a self-improvement project.” This is truth out of balance. It is true that only God has the power to transform our hearts, but it is a false implication that we are then not to work hard. Listen to the balance in these passages. Paul says to the Philippians, Continue to work out your salvation with fear and trembling, 13 for it is God who works in you to will and to act in order to fulfill his good purpose. (Philippians 2:12–13.) We work because God is at work in us. To the Corinthians Paul wrote, 10 But by the grace of God I am what I am, and his grace to me was not without effect. No, I worked harder than all of them—yet not I, but the grace of God that was with me. (1 Corinthians 15:10.) Paul worked hard, but it was only by the grace of God that he was transformed. The life that God has for us is not one we can manufacture. He is offering us not just self-improvement, but a different kind of life, the life of God himself. He invites us into the divine family. God invites us into a personal relationship with him. Only God can do this, but we must intentionally choose to pursue this Christ-life. Today I invite you to decide. I invite you to make an intentional decision to pursue Christlikeness. I realize this is a big deal. Frankly, as I look at the vision of being the number one racquetball player in Texas, I have decided not to pursue it. Even if I had the potential, which is a big question mark, it is not worth it to me. The price is too high for the limited value of that goal. On the other hand, I have decided to pursue Christlikeness. The high price is nothing compared to the incalculable value of the goal. I invite you to make the same decision today. A major reason why so many Christians have a superficial faith is that they have not made this decision. They are playing church, not fully following Christ. The problem with the lack of spiritual transformation is not that it is impossible, but that it was never chosen. Christians may desire and wish for it, but they have not decided to do what Christ said. This decision has major implications for your life. It will lead to quitting some things and starting other ones. You will invest your time and money differently. We will not simply drift into Christlikeness. It requires an intentional choice, a firm decision. But let me blow away one other misconception. Progress to Christlikeness is not just trying harder, but training wisely. I make this mistake in racquetball. When I walk into the court, I tell myself I will just try harder this time to hit good shots. That sounds good, but it does not work. Let’s say I want to play the song “Amazing Grace” on the keyboard, even though I have not learned how to play, nor have I practiced. I did take lessons for one year in 6th grade and it went very poorly. I was a miserable failure musically. A trained person will play without trying really hard. “There is an immense difference between training to do something and trying to do something.”  Many Christians simply try harder to follow Jesus. Spiritual transformation is not so much a matter of trying harder, but rather training wisely. Paul wrote to his associate Timothy, Train yourself to be godly. For physical training is of some value, but godliness has value for all things, holding promise for both the present life and the life to come. (1 Timothy 4:7-10.) The Greek word “train” is from gumnazo, the word from which we get our words gymnasium and gymnastics. It means to train or exercise and implies rigorous, strenuous, self-sacrificing training an athlete undergoes when preparing to compete. If you really want to be a godly man or a godly woman, you have to be willing to train. We are familiar with what is required for physical transformation. We’ve all seen the before and after pictures. Don’t believe the lies that you can take a pill or do the right workout 5 minutes a day and get ripped. It requires dedication to regular training. The same applies to growing in Christlikeness, in joy, forgiveness, generosity and faith. We don’t just try hard to be joyful, we train in joy. Today I am inviting you to make an intentional decision to follow Jesus Christ. Will you choose to follow Jesus Christ, all-in holding nothing back? Can you say, “ I will follow Jesus?” If you do not yet long for God, pray that you will thirst for God. Knowing it will have major implications for your life, choose to pursue Christ. The apostle Paul made this decision. In one of my favorite passages, Philippians chapter 3, Paul passionately declares his decision. 7 But whatever were gains to me I now consider loss for the sake of Christ. 8 What is more, I consider everything a loss because of the surpassing worth of knowing Christ Jesus my Lord, for whose sake I have lost all things. I consider them garbage, that I may gain Christ 9 and be found in him, not having a righteousness of my own that comes from the law, but that which is through faith in Christ—the righteousness that comes from God on the basis of faith. 10 I want to know Christ—yes, to know the power of his resurrection and participation in his sufferings, becoming like him in his death, 11 and so, somehow, attaining to the resurrection from the dead. 12 Not that I have already obtained all this, or have already arrived at my goal, but I press on to take hold of that for which Christ Jesus took hold of me. 13 Brothers and sisters, I do not consider myself yet to have taken hold of it. But one thing I do: Forgetting what is behind and straining toward what is ahead, 14 I press on toward the goal to win the prize for which God has called me heavenward in Christ Jesus. (Philippians 3:7–14.) Using marketplace language of profit and loss, Paul says everything in the credit column has been transferred to the debit column. Christ alone stands in the credit column. On a dusty road heading into the city of Damascus, Paul encountered the living Christ and his life was never the same again. He thought he was such a good person, so successful. Now he says it was all loss, rubbish. Rubbish is a strong word, in Greek, Skubala—a vulgarity referring to excrement and to refuse. It refers to filth in an open sewer. Paul says everything is loss compared to knowing Christ, which is of surpassing value. Paul wants to gain Christ, not having a righteousness of his own, but that which is through Christ by faith. Some religious teachers were trying to make people religious by insisting that they follow their rules. But righteousness does not rest on the performance of religious activities. No amount of self-improvement or religious effort can make anyone right with God. You can be righteous through Christ if you will admit your sin and trust in Jesus Christ to give you his righteousness. Paul declares that he wants to know Christ—so do I. He knows he has not arrived, so he presses on. He realizes he is on the path, but not yet at the destination of Christlikeness. His total focus is to know Christ intimately. That focus controls his life. With confidence in the power of God, Paul forgets what is behind and strains to what is ahead. Forget past sin and guilt that could hold you back. Forget past spiritual success. Instead strain toward what is ahead. The word picture is of a racer going hard for the tape. It describes him with eyes for nothing but the goal, going flat out for the finish. Press on for the goal, the prize. The greatest prize is to know Christ deeply. Some people mistakenly view the Christian life as a passive affair in which you simply let go and let God. The Bible describes us as soldiers, farmers and athletes. We are runners who strain forward to win the prize. But first you must decide you want to run the race, that you want the prize. If you intentionally decide to pursue Christ with all your heart, you can experience a divine quality of life that most people merely wish for. It is possible to live in such a way that people say to themselves, “Wow! I didn’t know that a life could look like that.”  It can happen in the power of God. But you must decide. You must choose. Will you decide to follow Jesus? Dallas Willard, Renovation of the Heart: Putting on the Character of Christ. (Colorado Springs: Navpress, 2002), 22.